My wife, the Empress Consort and I, 38th Yamato Emperor of Neighpon had arrived in the Northwest regions of the world. To Småreland we are! A vale of enchantment, beauty and history! For lo, what exciting adventures heed our appetite for exploring. "To the bridge of Bifröst we shall go!!" Declared the Empress. Of course I had chuckled at her immeadiate request. "Empress dearie, we need to land ashore and then we can follow our iternary. The bridge to the great tree Yggdrasil and beyond that the realm of the Gods will wait until next morning my love!" I would then smile and kiss her cheek. My wife has always been one for a great penchant for daring sights. She's my Daring Do, but I still love her. As we had finally docked The Sapphire Arrow, we were warmly welcomed by the local King and Queen of Småreland's commitee. From there we were picked up by carriage and arriving at a local Jarl's fortress, we were treated to an extravagant and lavish meal of lingonberry pie, smoked cheese, blueberry ale, and garlic bread. What a hearty meal, we then proceeded to rest as the road here was long and wearysome. For the remainer of the evening, we had enjoyed a nice stroll by a great crystal clear lake by the mountainside and forests. Last edited by Diamond Shine on 1/17/18 01:52 PM, edited 1 time in total. Another grand day we had spent in Småreland. Today was more eventful than yesterday which was spent on only arrival. We had departed the Jarl's castle early morning at the break of first sunlight. Making way where we were taken to the castle of the regional King's. After a three hour carriage ride, we were again welcomed warmly and treated to a breakfast in the royal dining hall. A large meal of fresh baked dark rye bread with a cheese spread over it, lingonberry pudding served warm and hoof squeezed orange juice. I had followed that hearty breakfast with a brief coneference with the local rulers about Neighponese and Smårelandish relations and other affairs between our countries lasting a good two hours and a half. With that afternoon, my wife and my son Aurora Relic couldn't contain their excitement as I had promised them once arriving. We would visit the rainbow bride known as Bifröst, the bridge between the mortal world and the realm of the Gods, for the region. Relic squealed happily once we crossed it and up the tree of Yggdrasil and finally entered the lair of the God Thor where we made audience with the thunderous deity. Evening come and we returned back to Småreland to have dinner with the King once more before we settled down. My wife and I were so enamored by the nighttime nature that we strolled the valley around the castle. Sure we have Aurora Borealis in Neighpon, but I must say it's more colorful and bright here. Soon retiring to the castle late at night as we still have more to explore the next few days. Arriving in the Southeast Haysian region. Whew, were we greeting by a heavy rainfall upon arrival from the Mnemonic Riddle once we docked at shore at the pier. Nonetheless despite being soggy from the intense moisture in the air, our welcome committee was warm and friendly as we boarded up some carriages. Hours later arriving more inland to Patrot Laos, shame I was not to make audience with the Queen today. Also, good thing too! My coat is soggy as ever, therefore my mane and tail are too a mess and I find myself unpresentable to the regional royalty here! That shall be remedied tomorrow however. I must say! This dinner we were presented with was extravagant, albeit spicy. Poor Aurora Relic, my son couldn't take the piquancy of the meal we were given. Sticky white rice with a red pepper dipping sauce, equally spicy red curry noodles and carrot stew with cake soaked in a very sweet coconut milk. This was indeed a great meal, surely I have gained a few pounds after it. At night after my son passed out after the long boat ride, I would retreat to a nearby waterfall in the thick rainforests heavily covering the entire country. Shame, I wish my beloved wife would come along...she has been having heavy contractions with our foal. It's a matter of time before she bursts again! I would gaze up at the starry sky while soaking in the cool water, listening to the loud array of nature around me. This is day one of seven here in Patrot Laos. The previous day and today were rather pleasant. Aurora Relic and I started the day at arriving at the capital city of Vientail, meeting with the King and Queen and we were served a generous breakfast of rice in coconut milk, and mango juice. Afterwards His Majesty's family along with us took a stroll of the city, visiting market places. I stopped at a jeweler vendor and purchased a nice looking turquoise pendant to give to my wife back home in Neighpon. Following the market place, we took a ride along the Mekolt river delta, nearing the border of the Khmare Kingdom. With nightfall coming, King Dha Dance, a good old friend to my late father and I went hiking up the mountainside and through a thick heavy humid rainforest. I swear, does it ever stop pouring down rain!?!? I reek of sweat and rainwater! Anyways, after that. Dha and I have a good spar with recently crafted traditional Patrot Laotian blades. I was able to knock him off his hooves. Foolish old stallion messing with a youthful one. Regardless, he gave me a decent sized slash in my left hind leg, but at least he apologized for it and patched me up right away. Finishing up our sparring and hike, we rejoined the Queen and my son and his for dinner, again of sticky rice in a red curry dipping sauce, carrot curry and coconut shakes. Mmmm mmm! This is day three of seven in Patrot Laos, I will be coming home soon my sweet Empress, in time for our foal to be born! Seems my little set back, meaning my hindleg injury had might be in pain. But still regardless, I pull through despite the sting. It was another day out hiking with King Dha Dance out in the Mekolt River Delta Valley. Still, the weather is sticky, humid and hot. Phew, how I miss the temperate Neighponese climate up north in Haysia. After more training with the King, we again settled down for a nice dinner, a repeat of the last few days.... spicy curry sauce and stick rice with a green curry this time and coconut cake. Afterwards after a soak in the nearby waterfalls. I had tea with Queen Lacquer Lotus, the tea here had a earthy taste to it. Not unfamiliar to Neighponese earth teas. Heheh. Well, that was it for the day. More to be written tomorrow. Day four of seven in Patrot Laos. I apologize dear diary for neglecting to write down what had occurred during the last few days in the Southeast of Haysia. I shall write this as the Mnemonic Riddle sails away. On my way back to Neighpon, back to my family and country. The remaining few last days in the humid tropical nation of Patrot Laos were repetitive I say. Breakfast with King Dha Dance, Queen Lacquer Lotus and Prince Dha Shay. Hiking with the old king, more sparring in the soggy rainforest. Should I mention during the hike of day five was eventful and not in a good way. The hindleg with my long gash from the accident a few days before...well I lost my footing and went tumbling down a hill and into a bog, I ended up breaking that said already wounded leg. Oh colt how utterly wonderful!! I need to be more cautious with such harsh terrains let it be rigid rocky mountainsides, scorching arid deserts, frigid arctic tundras, heck even open meadows can prove to be a danger heheh! "Clumsy lad!" Old King Dha Dance, best friend to my late father Emperor Rising Taiyo scoffed at me as he pulled me out of the murky water I had fallen in. I shot a icy glare when he said that, but gave him a chuckle afterwards. After that incident, I was in no more shape or condition to continue anymore hikes for the remaining duration of my stay in Patrot Laos. And as such, I returned to Vientail with the royals and made myself comfortable in their lavish golden ornate guestrooms. Thankfully due to my setback, it felt good to be nice and clean, having my fine Prench lavender and vanilla cologne on again, and not dripping of rainwater and reeking of sweat and overall looking like a soggy carpet. That was Day five and six in a nutshell. Day seven was my final day here, and not doing much because again I'm injured. Good to have a loyal animal companion. My kitsune Shiro stayed by my side the entire trip and whimpered knowing her master is hurt and unable to move much. What will my wife say seeing the state of my hindleg? Bah, another lecturing I need to be careful. Heheh, whatever! Anyways, the day went on as the same as any other here. Breakfast, lunch and dinner with the Royal Family. Having evening tea with Queen Lacquer Lotus then settling in for the night. This concludes my week long time in Patrot Laos. I shall finish writing here, it is late and I need to rest once we dock back in Neighpon. The Sapphire Arrow would finally set down and land upon the Eastern Europan country of Ukrein, mainly as she needed refueling as it is a long route to the destination of Bales in the far West of Europa. It would be several hours before taking off and resuming travel. Coming along is my mother, the Empress Dowager, Diamond Moon, Crown Prince Aurora Relic and Princess Diamond Dust, along my sister, Princess Peony Charm. It is a nice little village on the Southwestern Ukreinian countryside where it was along a forest and straddled on the borders of Ponska and Magyarorstág, tucked away at the corner of the three countries. Quite little petite and humble setting. We were treated to a nice, pleasant meal of potato cakes, cold beet stew and raisin and cinnamon bread. Quite a hearty meal but still delicious with every bite. We need to stock some of this aboard the royal airship before departure. Mmmm! "You were right my son, I really needed to get out. I've been cooped up in the Palace since.....since your father died." The old Empress sighed sadly, shedding a single tear. "There there mother...we both miss him dearly." I would assure her. "But we need to look onto the future, not dwell on the past. The future is bright and prosperous!" I smiled and comforted my dear mother. "Yeah, grandmother!" Aurora chimed in happily. "Daddy's a good ruler and super awesome!!" He fluttered his wings at her. I couldn't help but smile and laugh at his silly response. Nonetheless after we had our fill with the villagers bountiful feast they made for us to show hospitality and kindness. I nod and say to them in their native tongue. "My dyakuyemo vam za yizhu. My shchyro vdyachni za vashu dobrotu!" If my wife had attended this abroad travel, she'd die for the food, this is indeed some cuisine to die for! But it's best she stay behind again, she needs to tend to my younger two. Sakura Hoshi and newborn Quasar Sky. With the sun setting, I took a stroll with my sister, two foals, Aurora Relic and Diamond Dust, my mother and pet kyuubi Shiro. Enjoying the spring like climate upon the Eastern Europan state. The trees pine leaves glistening and bathing in the golden shades of the sunset sky as a mixture of blues, oranges, pinks and purples painted along the vast sky, like an artist's palette. This is a truly a most alluring sight to see. My adventurous wife would've admired it. This is my very first visit to Ukrein, although not my intended destination...not until late summer this year at least. Regardless, I am already impressed with the magnificent scenery and hospitiality of the local ponyfolk...and I just have only stepped hoof onto the countryside. More logs to write in. Finally arriving at the country of Bales, greeting my family was cool moist rainy overcast weather. We were instantly rendezvous to Castle Llŷr where I will be staying with brief meetings with King Llŷr and his Queen for the next few days or so. We were to arrive two hours earlier. But do to a raid that occurred on the fertile border of Prance and Germaney were we assaulted by a failed siege raid of sky pirates, those foolish griffon bandits tried and utterly failed to raid and piracy thanks to my small guard entourage and I driving them off. This first evening was a calming, soothing and comforting meal in Castle Llŷr's dining hall with a meal of potato soup, traditional Belsh cheese on toasted garlic wheat bread and dark ale. I went a little over board on the drinks as I guzzled down four of these Belsh ales, therefore I write this while I'm tipsy. I nonetheless strolled the Bales countryside with my mother and sister this evening...or at least tried since I'm slightly drunk. "Silly colt! Just don't make a complete idiot of yourself with your hosts!" Mother told me in a stern voice as we walked along a verdant vale of tulips and daisies. "You're Emperor, but as long as you don't spew nonsense...you should be fine." I whinnied at the old Mother Empress. "Don't coddle me mother! I'm going to be fine!! I'm not a little foal anymore!" I accosted her, maybe it was wrong to speak to her like that, she is my mother after all. But I am a full grown stallion by the Gods! "Diamond!!" Shouted my sister. "Be respectful to mother!!" "That's quite alright, Peony dear!" My mother piped in once more. "Please don't fight! I hate it when you fight like that!!" She then gave a more serious tone. "Sorry mother.." We both say to her. The rest of the evening proved to be rather uneventful after retiring back to the castle we are guests at. Only these next few days will determine the very bitter relationship between the Neighponese and Belsh. I spent the last few minutes on an open air balcony, gazing at the hues of pale purplish clouds blanketing the night sky and thus obscuring any sight of the moon or stars. I lay in bed feeling a strong alcoholic buzz from my indulging, I pray I don't wake the next morning feeling ill of a hangover. More to write tomorrow. Last edited by Diamond Shine on 2/28/18 10:02 PM, edited 1 time in total. Proceeding from where I had left off in my last entry log the previous night. Thank Amaterasu and the other Gods that I had not befallen of a hangover this morning!! I started the day off with a hearty traditional Belsh meal of cheese on toast, lignonberry pudding served warm atop some shortbread cake and orange juice to wash it down. Joining me was my mother, sister, son and eldest daughter with King Llŷr at the breakfast briefing of what was to take place that day. It's a good thing the pale bluish hued monarch saw some good in me, I'm the first Neighponese emperor to visit Bales in sixty five years! Indeed, last diplomatic mission to Bales by the Neighponese Royal Family was by my grandfather, Emperor Silver Jolt in the summer of 3311. From information gathered by His Grace, King Llŷr and that of my uncle, Azure Blade...relations between the Belsh and Neighponese were rather unfavorable and most bitter during the reigns of the previous two emperors. However, Llŷr was cooperative with me improving them. "You, my colt seem to want to rebuild relations with us Belsh! I can see you're better than your father, Rising Taiyo!!" Those were words to make my blood boil. My father, the stallion who was my role model, being mocked for poor diplomacy between Bales and Neighpon. But I kept my anger to myself, it wouldn't do any good to worsen the situation, and given, had I been drunk now rather than last night...I would have easily given in to impulses of fury and rage. Irrelevant emotions that matter to me right now, the meeting with King Llŷr and myself lasted a good two hours, whilst my family got to enjoy the nearby scenery and towns nearby. How I envied them at that moment! Aurora Relic and my daughter, Diamond Dust come back with great smiles, happy to spend quality time with their grandmother and aunt. Late into the afternoon, when the sun was at its highest peak in the daylight, my foals came back with my Mother Empress and sister after touring a nearby town. "Daddy, you should have been with us!" Relic chipped in happily as he fluttered his wings. "Grandmother treated us to the best ice cream ever!" My old mother nodded at his reply and patted his head. I had no choice but to shrug and force them to repeat their leisurely afternoon, just so I now can be part of it! "But daddy!! My hooves hurt..." Complained my little toddler daughter. To remedy her weary petite hooves, I let her ride and lay on my back as we strolled the hills and then into the cobblestone paths marking the way to the village. Poor tot, she dozed off onto my back the whole ride, her forelegs hugging my neck to ensure she doesn't fall. Come sunset and dinner was served back at Castle Llŷr. A meal of carrot and cheese stew, fresh baked bread, and apple cobbler with again, dark Belsh ale to wash the scrumptious meal down. I took care to watch myself from further indulging, so I therefore limited myself to just one mug this time. Afterwards, it may have been to early as we don't leave for another few days but King Llŷr presents me with some gifts. A chrome colored mace and a dark grey cape with fur lining it. Silky to the touch and woolen as well, but I still was apprieciative of such treasures. I'm weary and I will write more tomorrow as that is all that took place today. I had started this morning, waking up to morning fog at an hour before dawn breaks its early rays of sunlight. My family and I had departed from Castle Llŷr by carriage and headed north to the province of Dyfed, a territory tucked in the Northwest seaside coast, straddled on the border of Yr Wyvern and Griffonstone being on the other side of the sea. We were greeted at a pleasant breakfast with the regional lord, Pwyll at his fortress at on a cliff at the seaside with the waves crashing far below against the rocks jutting out from the oceans beneath. A breakfast consisting of pumpkin and cheese tarts, garlic bread and cranberry and lignonberry juice. 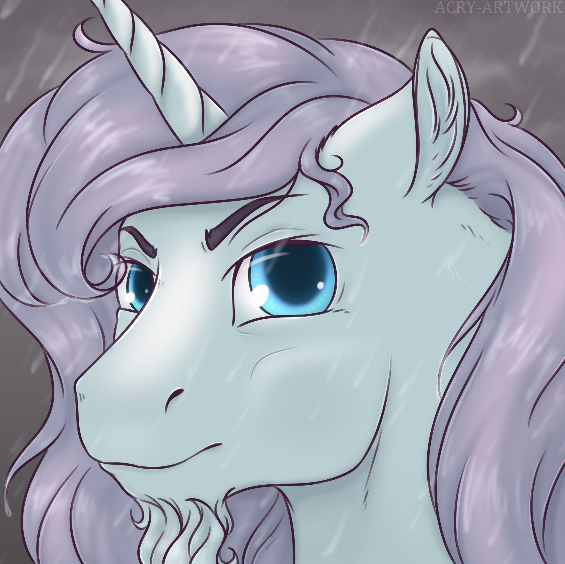 I spent the day alone, leisurely strolling the vast verdant meadows, wearing my new garment given to me yesterday as a light soothing rain shower wetting my mane gently. Afterwards having a brief conversation with Lord Pwyll in his private study over some Belsh ale, a friendly amiable chat I must say as I drank down two of these ales. The remainder of the day was dull and boorish, dinner was nice, more whole wheat bread with a slightly pungent cheese dipping sauce and potato and carrot stew as the main entree with more Belsh ale. The rest of the evening was visiting a neaby Breezie forest and silly little Aurora Relic trying to catch them, he spent the evening pursuing them to no avail. The time has come to rest, more to write tomorrow.